Welcome to Gigabyte edition 5, our last issue for 2016. This monthly newsletter brings you information about graduate research matters, opportunities for career and personal development, and we share stories about our Graduate Research students, alumni, and supervisors. We welcome your contributions. Please submit anything you would like to share with your colleagues, and give us feedback so that we can make this newsletter exactly what you want. Submission deadline for next newsletter: 27 January 2017 . Enjoy! In 2016, we have focused on building the Graduate Research community in FIT and facilitating social and academic activities organised by our graduate researchers. Highlights have included a visit to our Sunway campus in Malaysia, our fantastic Graduate Research Retreat, and the inaugural Symposium in our FIT GR Series with guest speaker Dr Robyn Williams from ABC Radio National Radio's Science Show. The Innovation Showcase featured a selection of posters from GR students that created a buzz of excitement amongst our industry guests. There have been some great events organised by our GR Women in IT Network, and delicious food at our many cultural lunches. And the introduction of GigaByte! It is wonderful being part of such a vibrant and diverse community. 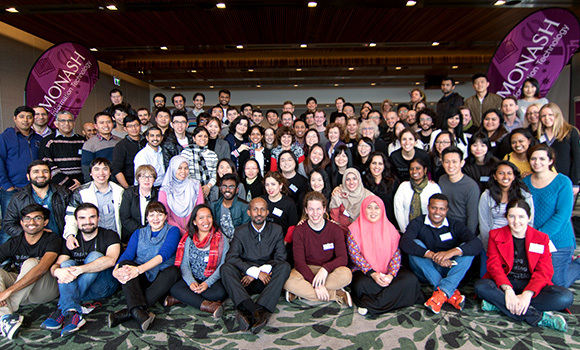 Many thanks to our GR Student Committee members, GR Retreat and other events organising committees, the GR student representatives on the Faculty's Graduate Research Committee, and to all of you for being such wonderful community members. Congratulations for your many achievements throughout the year. My very best wishes for the festive season, the summer holidays and the new year 2017 - I am looking forward to continuing in my role as Associate Dean Graduate Research then. As I often say, it's the best job in the faculty! You are invited to join your Graduate Research colleagues and GR staff at a special Faculty lunch to mark the end of another wonderful year for our community, and to celebrate this festive season. WHO IS INVITED ? All FIT Graduate Research students. The invitation is also extended to your family members, husbands, wives, partners and children. WHEN? Friday 16 December from 12.30pm -2.00pm. Please RSVP by midday Wednesday 14 December. New Website - We have a revised Graduate Research presence on the new FIT website. We are still working on making this as good as we can however in order to get it over the line as quickly as possible, we had to go with 'minimum viable product'. Please let us know if there are gaps in the information or other resources you'd appreciate having on the website. The SFS is available for PhD students who have completed their Mid-Candidature Review and have used their candidature and travel funds. Applications for funding between $1,000 and $5,000 will be considered. Round 1, 2017 of the Faculty of IT Supplementary Funding Scheme (SFS) and applications are due by 5:00pm, 3 January 2017. Round 1 is for students who will submit their thesis between 1 January – 31 March. Applications must be submitted by 5:00pm, 1 January 2017. Recipients of the PPA receive a living allowance for up to 8 weeks after submitting their thesis to write up their research for publication while they await the result of their examination. The event will be a case study-led forum where leading experts will share their processes and procedures to preserve digital collections, as well as enhance the richness and integrity of archives. This session will discuss matters relating to eligibility and compliance with NHMRC funding rules for these schemes. We will also cover new MRO compliance checking and faculty approval processes using the new online system, Pure. The University of Chicago is looking for a new team member; a “programming postdoc or a researching programmer” — preferably with some OpenStack expertise. Interested? Read on. This project is expected to run for 6 months. The successful candidate will receive $3,000 per month of the internship. Applications close 19 December. This project is expected to run for 4 months. The successful candidate will receive $3,000 per month of the internship. Applications close 19 December. Dr Panraphee Raphiphan (graduated 2015) See picture of Panraphee above. After completing her PhD with FIT Panraphee returned to Thailand where she works in the media as an Entrepreneur and as a University lecturer. Her media work stretches across television, radio and online, channels focused on technology in everyday life. In addition, she produces her own Tech show called iT 24 Hours (iT24Hrs) on nationwide TV channels and on radio. Panraphee’s research for her PhD was focused on a context-aware traffic congestion estimation framework to overcome missing sensory data in Bangkok. Traffic congestion is the cause of pollution and economic loss. The real time traffic state report can alleviate this problem by assisting drivers for route planning and choosing unblocked roads. More complete traffic information could lead to more accurate route planning. To ensure the continuity of reported traffic information, she propose the CATE framework that can estimates traffic information even though sensory data is unavailable and provide the guideline to improve existing traffic information system. Nitin is now a working in the United States as a Research Fellow in Radiation Oncology Brigham and Women's Hospital, Boston, and before that he was a Postdoctoral fellow at Harvard Medical School. Nitin's PhD study involved investigating different techniques for improving the performance of iris recognition systems in less constrained environments using a video-based approach. Firstly, a new model for the extraction of eye images from NIR face videos is presented. Secondly, an optimal frame selection technique for enhancing the performance of video-based iris recognition systems is proposed. Thirdly, a robust iris segmentation system designed primarily for eye images captured in less constrained imaging conditions is presented. Fourthly, a model for automatically predicting iris segmentation errors in an iris recognition system is proposed. Finally, a method which takes advantage of the availability of multiple frames to build an optimized iris code is developed. Our results and experiments suggest that incorporation of the above methods in traditional iris recognition systems will be useful for the adoption of this technology by a larger community. MGE only accepts applications for leave (enrolment/scholarship), scholarship extension, thesis submission extension and return from leave/study away received through the online-variation system. Paper based forms for these variations will no longer be processed. Morning tea The Caulfield Graduate Research Students are hosting a 'Thank you' Morning tea at 10am in the PhD Kitchen level 7 Blg H. on Wednesday 14 December. This is and annual event to thank the Caulfield Admin staff, GR coordinators and team for all their support across the year. Please rsvp by email to helen.cridland@monash.edu by Friday 9 December that will help with the catering arrangements. Failure to let MGE know you have returned to study may cause adverse impacts on your candidature, such as delays in thesis submission processing. FUNDING OPPORTUNITIES, AWARDS AND PRIZES, RESEARCH EVENTS Please make a habit of reading these newsletters as they are filled with news about all manner of opportunities.